I always love to hear from other female cyclists from around the world who are encouraging women to ride bikes. So when Barbara Kornbluh from New Jersey in the US contacted me a few weeks ago I was intrigued to hear her story, about her tandem cycling business, her own apparel brand and most especially about her regular bike rides with her ‘Evelyn Hill’ group. 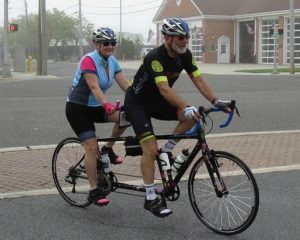 Barbara and her husband Mel, of Pittsgrove Township, New Jersey, have been riding tandem for more than 44 years, logging 191,000 miles (over 300,000 km) as they get fit together. They also split up and rode with their two children when they were younger. The Kornbluhs created Tandems East, a New Jersey-based company that makes, sells and services tandem bikes as well as schedules tandem tours. I really enjoyed Barbara’s story about starting a regular women’s bike ride so I’ll let her tell it in her own words. Over to you Barbara…..
“It’s early December and the weather has changed. I take a deep breath and count our blessings. Each morning while walking our dog I witness the beautiful sunrise, reflect on my terrific and talented family and thrive in the positive energy we all share as a tandem cycling community. Every morning I work out at our local gym. I am not a “buff” super power. I am just a woman in her sixties who desires to be healthy and fit as long as possible and to keep my body parts functioning without pain. Because of our continuous cycling, my reputation at this sweat box sometimes embarrasses me. Personally I tend to be on the shyer side with little boasting. But, ask me a question, I have no problem answering honestly. If you work out in a gym, you know the lady’s locker room scene. Half undressed women stand in front of a shared mirror getting ready for whatever is next on their daily schedule. Conversations hop from gym talk to family to fashion and back. I really don’t know many of the women outside of this morning ritual. Somehow they all seem to know I ride a bicycle. I have always made it clear that this bicycle has two seats and I am the stoker. They are interested but claim this is not for them. On one particular morning someone named Meghan asked if I would start up a women’s cycling group. Like many, she had road fear but thought she would like to learn from me. This haunted me for days. As always, encouragement came from my husband Mel responding, “You should do this”. Thoughts travelled back to our early years of cycling when I did ride a single bike on alternate tandem training rides. I struggled to keep up with the male riders and still am haunted by one racer who continually shouted out commands that made me twitch! It was a Monday evening in May when we first gathered at the Evelyn Hill Cycling Tandems East warehouse, less than one mile from our home. My heart raced with anticipation. What did I know about leading such a group? I may have racked up a zillion miles, but they were on the back of a tandem. My part did not involve balancing a bike in traffic, shifting confusing gears, or changing flat tyres. And there was no chance I would ever get these piano fingers wrapped in grease and other stuff that keeps bicycles rolling. One by one, women arrived. Some had boardwalk cruisers, some bikes were hot and fast and others were clearly just dusted off after years of no use, just like mine. We held a bike check first and I instructed the ladies about riding safely and respectfully. Earlier I had mapped out a four mile (6.5 km) course along our neighbourhood country roads where cars seem friendlier and people are more courteous than most. It was hot and the ten or so women nervously tightened their helmets. Slowly we turned onto the road in a single pace-line with me in the lead. Tammy brought up the sweep making sure the last riders were comfortable. We took turns doing this making certain all were feeling secure. There were no records set. Just a group of female cyclists out for exercise hoping to make new friends. At the end everyone promised to return the following week and bring a friend. We did this all summer. Our ages ranged from 18 to mid-70s. Gradually word got out and new women showed up. Some came back some did not. As the weeks went by my ladies got stronger and were ready for longer distances. They learned safety, a bit about gears and Mel helped adjust bikes, attach safety lights and perform quick fixes where needed. This was not about how far or fast we rode. It was about women cycling with other women, gaining personal strength from one another and setting individual goals. At the end of the summer on a beautiful October afternoon, the Evelyn Hill Cycling group celebrated personal accomplishments riding the bike path in Cape May County, followed by a celebration at our nearby beach condo. Our husbands and boyfriends were our support crew, making sure each traffic crossing was safely met. They even greeted us half way at mile marker 11 with refreshments and more encouragement. Yes this was amazing. A group of women who started out slow and weak gradually were empowered to find their own strength, both physically and mentally. It was equally an accomplishment for me. I had no idea I could handle a single bike on the road. I had to learn to shift gears and understand a bike just like the new cyclists. This was a personal best for me. I have performed in concerts for audiences and causes that most would never challenge. But for me, taking this personal challenge was an epic moment. I look forward to the new spring season when we start up again. This year there will be two groups…one for the experienced and another for those who wish to ride a bike for the first time along quiet country roads, in a pace line with other women… making themselves healthier and fulfilled. That’s a great story from Barbara. Thanks. Please share your stories about encouraging women to ride bikes via comments or the Women Who Cycle Facebook page. Previous Post:Is the 2018 Giro Rosa really the biggest women’s bike race of the year?